I knew next to nothing about Portugal when I decided to travel to Lisbon. My knowledge of the country only went up to about the 16th century and the period of exploration. Even my mom’s insistence on the usefulness of Spanish for basic conversations with Romance language speakers did not help me and I was unable to have the Spanish-Portuguese conversations I believed I would. Initially, I tried speaking Spanish. I had signed a Spanish-only pledge for the quarter and did not want to slip into English when Spanish was so similar to Portuguese. The language barrier proved to be higher than I anticipated. My fellow Stanford in Madrid students and I tried to order in Spanish. Our waitress would not have that. She helped each of us pronounce the Portuguese words from the menu. We quickly learned that speaking Spanish only invited Portuguese lessons while English worked and got us what we wanted — the cost of an item, directions, etc. Attempting Portuguese transformed us from travelers into friends. It was not long before “obrigada” and “obrigado” — female and male versions of thank you — were added to our regular vocabularies. In Portugal, I learned what pride the Portuguese have for their language. More than anywhere else I have visited, the locals wanted to teach us. Whether it was a simple “hello” or “thank you,” they wanted to share. This even rang true in commercial places, where employees would take the time to explain cultural nuances, even if sacrificing efficiency to do so. 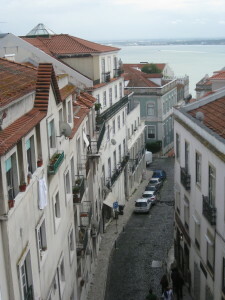 Once I got past the language barrier, Lisbon eased my homesickness, due to its striking similarity to San Francisco. We wandered through Lisbon’s hilly streets, populated by cable cars, and stumbled upon a large flea market. In the distance, a red suspension bridge spanned the wide river. The fresh coastal air even smelled like San Francisco! A taste of Lisbon, a few lessons in Portuguese and many new experiences later, I returned to Madrid with my group for our last few weeks on the Iberian Peninsula. Want to read about Madrid? Follow Rebecca Amato’s blog about her study abroad experience.